One of the new features we are now offering is an app for drip campaigns. This gives you the ability to set up a series of messages in advance and send them to your prospects or customers according to any schedule you prefer. This is an extremely powerful communications tool that has the potential to help you engage better with people and keep them interested in your business. Drip campaigns are a tactic that’s been long used in email marketing. With this strategy, once people sign up for your list, you send them a series of emails through your email service or autoresponder. This can be any type of content, such as an educational course, promotional messages about your product or information about your latest events. Now you can do the same thing with SMS and MMS, which can be even more effective, given that open rates are much higher for text messages than for emails! 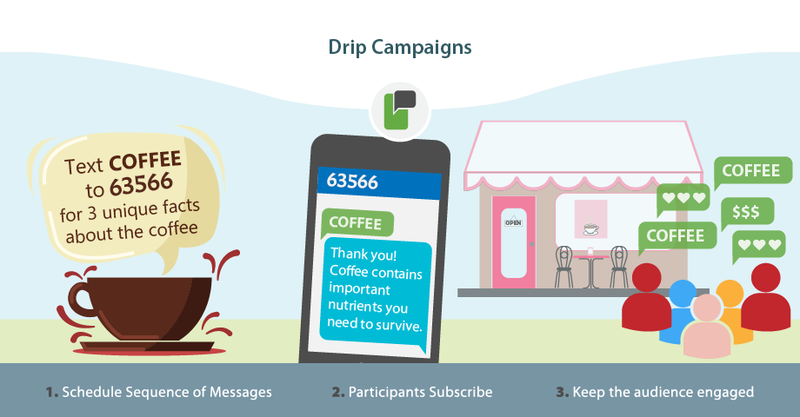 Here are some of the advantages of using our drip campaign app for your SMS or MMS campaigns. Drip campaigns work for any type of business. No matter what you’re promoting, drip campaigns are a great way to keep your SMS list better informed. Restaurants and nightclubs can send out messages about events and menus. Retail stores can keep customers updated about sales and promotions. Spas and salons can remind customers about their services. Perfect for educational campaigns. In addition to directly promoting your business, drip campaigns are ideal for creating educational campaigns or mini courses related to your industry. This is a good way to deliver real value to your subscribers and establish yourself as an authority. Saves you time. You can create all of your messages when it’s convenient and arrange for them to be sent in the future on autopilot. This helps you run your campaigns more efficiently. Send out messages at the best time. It’s always important to perform analytics to determine when your audience is most likely to respond to your messages. When you’ve determined this, drip campaigns make it easy to send out messages at the most opportune times. You can schedule your messages down to the day, hour and minute that best suits your purposes. Increase engagement. When people receive a series of messages from you, it improves your brand awareness. Additionally, when you send multiple messages there’s more likelihood that people will read and pay attention to at least some of them. Nurture leads. Some customers need to be exposed multiple times to a message before they respond. Drip campaigns let you provide sufficient information and educate your audience to help convert them. Drip campaigns are one of many features we offer to help you run profitable SMS and MMS campaigns. One of the fundamental principles of marketing is that you can increase engagement and conversions by increasing exposure to your messages. A drip campaign via text message marketing lets you do this in an effective way. This is another step towards automating your marketing and connecting more effectively with your audience.